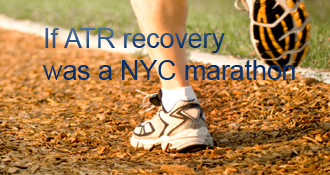 mariec has completed the grueling 26.2 ATR miles to full recovery! Things are becoming more normal. Tomorrow will be 8 weeks post op and I’m doing well. I’ve had 2 PT appointments (1x/week), the third tomorrow. Because of the movements I started before PT, I am ahead of schedule, just as I was hoping for. I have almost full ROM. My PT was surprised and thinks I’m doing excellent, but has also warned me to be cautious and not overdo. I’ve been in 2-shoes since my last ortho appointment 2 weeks ago, when they took the boot off. I still have a slight ‘hitch’ to my step, so PT says no treadmill yet. However, am hoping that tomorrow or the following week of PT that I will be released to start Pilates again. Hope everyone is still hanging in and recovering well! Ok, I’m now 4.5 weeks post op and am doing well in the boot. Haven’t used crutches at all. My heel/foot get quite sore after walking in the boot for about 3 hours or so, but then I take it off and give my foot a break. I usually just rest it and/or do some stretching. I have also been walking around the house without the boot. I don’t think I’m necessarily supposed to do this, but have been trying it out - with caution. Feels pretty good, but again gets sore if I do it for long periods. Hoping my next appointment (on the 10th) the boot will be off permanently and I’ll be off to PT, as well as allowed to finally drive! Hope everyone else is doing well with recovery! First Post Op Appt - Great Surprise…flat heel boot, FWB! Well, I went to my first post-op appointment in a bit of a fluster. I had to take my dog to the emergency vet at 1230 am and then attend a 6 am call for work. However, I still made it to my appointment on time and awake! I was curious to see the incisions (not bad) and what position the boot would be put in. Come to find out, they put me right into a flat heel (no angle) boot and I was told I could start bearing weight as I could tolerate, with or without crutches! I was a little apprehensive about this, but the day has progressed well. I’ve been walking without crutches most of the day and evening, with periodic breaks. The foot and heel definitely get sore, but not near what I expected. And even more surprising, little to no swelling! I have strict instructions to wear the boot when I’m up and while in bed, but can take it off while seated and start on ROM. I’m shocked that just two weeks and 1 day after surgery I am FWB! Now, the caveat - I had an FHL tendon transfer. My OS said this is one of the benefits. Fine by me! Just wish he would have told me that beforehand, because (if you read/recall my previous post) I already bought a VacoPed with an extra liner that will now need to get returned. I am keeping - and now using - the EvenUp shoe, it works great! So, as down as I was becoming about this injury and looking forward to the next step, I’m now over the moon! I’m sure the coming days will still prove trying and will have some aches and pains, but I’m now seeing some light. Hope others are recovering well! Anyone ever used products from aidmyachilles.com (freeze or inferno wraps)? Have been looking at their freeze and inferno wraps to help aid in recovery, but would like to know if anyone on here has used either product and if so, what they thought of them? I am now nearly 2 weeks post op and cannot wait for Thursday! I will be returning to the ortho office to have the splint taken off, staples/stitches removed and will see for the first time what my incisions look like. I must admit that for the last two nights, I’ve removed the splint but rebandaged the foot/leg over the dressing. I was having a very difficult time sleeping, as the splint was making the gauze on my incisions snag and pull. Very uncomfortable! One other thing to note, I’ve removed the splint tonight and actually - very gently - stood flat footed, which was done with no pain. I didn’t take a step, as I knew that would not be smart. I’ve also been gently stretching the foot/leg a bit in both directions (dorsi/plantar). The tendon (transfer) is very tight. I assume once I start walking with the boot and start ROM exercises that it will stretch?? I suppose any repairs feel tight/short at first, given the immobilization period. I ruptured my Achilles at the gym on 10/20. Funny how I knew what it was immediately, even though I had never read what these felt like or knew anyone personally who has experienced this. I had gone to the gym for my Pilates session (1 hour), then did a 15% incline walk on the treadmill (30 min) while waiting for an Intro to Boot Camp class to start. The class was being held outside in the parking lot because of the nice weather that day. We did some stretching and warm up exercises and then started to get into the workout. I was 40 minutes into the hour when we started doing some running (slightly uphill, on hard pavement/asphalt). We were to run to the top of the hill, do 10 squats then run back. Now, I thought with all the other working out I had done beforehand that my muscles were plenty warmed up. I felt good during the BC class as well. However, during the second run up the hill and completing my squats, I turned to run back and SNAP - I felt this sharp pop in the back of my leg. I turned to look behind me to see if I stepped in a hole, hit the curb or what. But as everyone else says, there was nothing there. That’s when I knew…it registered in my head immediately and then the dreadful thought ‘oh no, not my achilles’. There was a warm sensation through my calf, then I started seeing stars, feeling lightheaded and thought I was going to throw up! A trainer came out and carried me back into the gym, where they proceeded to ice it immediately. I managed to drive home (a bit difficult), uncertain if I needed to go to urgent care (only because some trainer said it probably wasn’t a rupture because he’d had one and that I wouldn’t be able to feel anything if it was - ha! wrong answer). Trusting my gut, I got home and had my mom take me. They diagnosed it as a partial rupture. Two days later, had an appointment with an ortho clinic. Their foot/ankle doctor took an X-ray (not sure why, didn’t seem to provide any insight). I asked if he did percutaneous fixes, as I didn’t really want open surgery. He said he did not; he would do a tendon transfer. Now, I had to actually ask him what that meant and why. Apparently, that was the only type of ‘fix’ he performed. I did not want to have surgery, but couldn’t really find alternatives in a good amount of time - I didn’t want this to go untreated for more than 10 days. So, I got online and started doing research. Luckily, this site is one of the first things I found. I must have read 200 posts/stories throughout the course of the first week. It has been very helpful to read the different triumphs and tribulations everyone has gone through. The worst part of the surgery for me was waiting for the nerve block to wear off. I was going nuts! I cannot stand to have that numb or tingling feeling. I don’t use novocaine at the dentist for the same reason. What a nightmare. After coming out of the pain block (30 hours), the worst part was noticing the muscle atrophy (which seemed to happen within a week) and then just having to sit around and be patient, leg elevated. One thing to note, my ortho said that my tendon probably ruptured due to degeneration. I was a bit put off by that answer, as I’m quite active and didn’t think I was that old. Maybe I ignore my age more than I should, but I don’t think 48 is that old, especially when healthy and active. As I read more online, I found that one other factor that can attribute to weak tendons is the use of corticosteriods. This is concerning, as I was getting a corticosteroid shot once a year for allergy/sinus issues. My doctor had always said having the shots - which are systemic - were not good to continue long term. While I’ve been very concerned about my other achilles since this injury occurred, this heightens the feeling even more. I think when I return to my activities, I will skip the boot camp and running, and instead will go back to focusing on pilates, yoga and strength training. Thanks beanie! I just have to be careful and not overdo, which isn’t always easy. But she warned me of permanent tendonopathy or tendonitis, which I certainly wouldn’t want. Saw your last post and it looks like you are doing excellent! Keep up the good work, too; I’ll be following you and trying to incorporate some of your PT as I get farther along. Sounds like you’re doing really well Marie, keep it up! Don’t be too worried. I know all OS take different approaches. It does sound like quite a long time to be in a cast. However, once you’re in the boot, you should be able to start ROM exercises. I’m 5 weeks post op (yesterday) and have been doing more than I was told, but not past any point of comfort. I found recently that massaging the site really helps; in one day it seemed to relieve quite a lot of the tightness and I was able to walk much better the next day on both feet, without the boot. Again, haven’t been told I can walk without the boot, but am taking baby steps, hoping to advance my recovery. I have my 6 week post op appointment next week and hoping the boot will be off and driving privileges returned. Hang in there…it will get better! I’m glad my post gave you something to look forward to. I know I read many stories on this site and felt the same. Very grateful for this site for that reason. My OS only does this type of procedure, which I didn’t know until I went in asking questions at the onset. Funny at the time he didn’t tell me the benefits - like getting into a flat foot boot immediately - but I probably wouldn’t have understood or appreciated what that really meant at that time. He did tell me that it nearly eliminates chance of rerupture, which is why I think he prefers this method. Hi beanie! Funny thing about my OS, I didn’t really like or trust him at first, nor did I really want this type of fix. Damaging a good part of the body to fix the bad part didn’t seem ideal to me. However, I am certainly grateful now, and told him so at my first checkup. I’m excited for PT! And I have been walking a bit today in 2 shoes…or boots here - it snowed today, first time and seems we are going to get dumped on a bit. I didn’t do this for more than a few minutes, as I expect I’m not supposed to be doing this yet. As for the feeling, I’m a really weird stickler about evenness, and was very concerned about my toe not being able to bend normally. However, I have found that it doesn’t bother me as much as I thought it would and it does still bend; it just doesn’t bend at the ‘knuckle’ part. My goal - not to rupture the other one. But if I did, I would do the same thing as was done on this side. You keep going strong, too! This site is amazing and definitely helps keep one hopeful; I am very grateful for this, otherwise I probably wouldn’t be where I am at today. Wow Mariec, this post just gave me so much to look forward to! I cannot wait until I am in my walking boot. I too am interested to hear about the FHL transfer. My surgeon thought that I may have to have this done as well, but luckily, he didn’t have to use it. At the time of my consultation though when we were discussing this possibility, he said people can generally be alright without a portion of this tendon. When I brought up that I love to do ballet though, he said I may never be able to do that activity again. What does it feel like? Glad your recovery is going so well! Mariec, It sounds like your OS has done a fantastic job of fixing you up and getting you back to normal! At 4.5 wks my foot was still at 20 degrees or 3 wedges, there’s no way I could have walked on it without the lift! Your recovery is outstanding and i think you’re going to love PT once it starts and be back to full strength in no time! I had a look at what an FHL transfer is and found an awesome video of the procedure. It’s pretty amazing and I’d love to know if you feel anything weird from your big toe when you point your toes or does it feel normal? Keep going strong and healing as well as you are! That’s such great news! It’s awesome to hear that you are doing so well! mariec’s AchillesBlog is proudly powered by WordPress and WPDesigner..